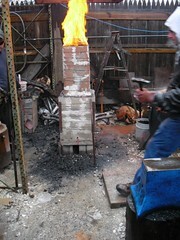 I made it over to the aforementioned "Fire and Brimstone" hammer-in over the weekend. It was a lot of fun. But, the rain an mud aside, it was a very fun time. The first demo I saw was of how to take mosaic damascus and manipulate it so that the patterns, which are in the middle of the bar, come to the outside. Two methods were demo'd: the first was to take the original 1" x 1" bar, reduce it to half its original thickness, which distorts the pattern; cut the bar on a 45-degree angle so the pattern is now undistorted, then take the slices, overlap them and TIG weld them to hold them together so the face with the pattern is now visible, and then forge weld the whole thing together. Use a light touch on the TIG torch, all you want to do is hold the pieces lightly together and keep out the air that might compromise the forge welds. Out of the original ~10" of 3/8" stock, after welding and hammering and cursing at the failed welds and splits in a couple of places, maybe 8" of usable 1" x 1/4" material was created. Yes, that's a lot of waste, probably about 75%. That's why this stuff sells for $35 or more for 1" x 1" x 1/8". None of the photos of this process really came out, but the final etch showed a beaufult pattern, with no obvious seams between the slices. 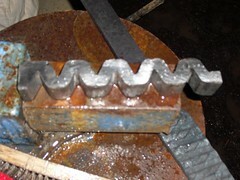 The second technique was to cut a similar 1.25" x 1.25" x 8" bar into a wave shape, then forge it flat. http://farm3.static.flickr.com/2772/4439729826_2c76143161_m.jpg for a good picture of the bar as cut. The demoer said he'd had someone else do the cutting -- again, a lot of the bar was lost achieve the effect. During the forging, several cracks and splits appeared, but a good portion of the stock survived. The demonstrator speculated that holding the piece post-weld at welding temp may encourage sticking due to grain growth across the interface. He noted that even the pros expect to lose 80-90 percent of damascus made to breakage, grinding losses, pattern manipulation, and associated processes. The steels used were 1084 and 15n20, a high contrast easy to weld combination with compatible heat treatment, working characteristics, and modulus of expansions. the moly in the 1084 makes a nice dark contrast to the brighter 15n20. Admiral carries 'em, I'll have to try some. The big event of the day was the large tatara-style smelter, run primarily by Jesus Hernandez. The ore was red oxide pigment, used in pottery glazes. Charcoal was used in a 4-to-1 ratio, by weight, added over several hours (they started at 6:30am, and finished up just before dinner). Like every other smelter I've seen, it leaked flame out every joint and seam, and it was a losing but necessary battle to spackle the leaks with furnace cement ever time a new jet of flame made an appearance. See the photos for some examples, just about every picture of the smelter shows a few jets here and there. 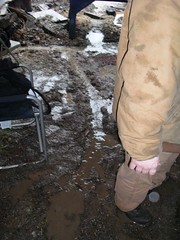 During the slag tapping, things looked good -- there was good "black slag," not a whole lot of bad "green slag," and a few brightly-sparking runs of cast iron. Since the desired goal is steely iron, with a high carbon content, and cast iron is essentially very high carbon steel (the higher the carbon, the lower the melting point), these were all good signs. Once you start getting the black slag, ferrosilicon, you should start recycling it back into the smelt as a flux and iron source. At least, that is the theory. You see, when they ran out of the 100lbs of ore, burnt up the last of the 400+ lbs of charcoal, and started tearing apart the smelter, hopes were high. Sadly, aside from a couple of small drips of steel, nothing but slag and a little cast iron were found, probably under 5 lbs of metal in total, and that was mostly slag. It may look small, but since it'll be forged out, that's enough to make a sword. Work at a "bright cherry" or "dim orange" to keep the dendrites (carbide formations) from dissolving back into the mix. Get it too hot, and toss it -- it becomes cast iron. The other wootz puck was smaller, and not as well defined, but definitely a solid piece of steel. Same crucible, same ratio, but a cooler burn, so things didn't settle as well at the end of the smelt. 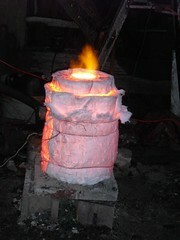 The last bit of the day was an example of Japanese style heat treatment, what is used on traditional katanas and tantos. Jesus Hernandez was the demonstrator, and he shared quite of bit of his hard-learned knowledge with us. The two plain steels he discussed were 1050 and W2, with a note that tamahagane, what we were trying to make in the big smelter, heat treats like 1050. Air cool after each stage, straightening. If, after the 1200F step you end up getting the blade too hot while grinding, reheat to 1000F and hold for 5-8 minutes, then air cool. You're now ready for the final plunge. 1500 5-8 min 3 times, air cool after each heat. To harden the blade and get a good hamon, you need to have a good clay, good quenching medium, an even heat, and a lot of patience. Jesus recommends, when learning the technique, to make 8 identical tanto blades and doing the following. Expect to lose all the blades, be happy if any survive and are actually presentable. For your clay, he uses a mixture, ratios unspecified, of fire clay, charcoal powder, and fine sand. Another smith recommeded a mix of 80% wood ash and 20% furnace cement. I've used straight furnace cement to good effect, but it's a real pain to get back off the blades, whereas the clay mixture washes right off. I wonder if using a ball mill to aid in mixing might help, they're easy enough to rig up. For a quench for W2, you should probably use a fast oil such as Parks 50. It's expensive, but so is everything else in this craft. Water is good for 1050/tamahagane, but you're going to need to know your water. Hard water is much like brine, and quenches faster than soft or pure water. Adding agitation, via air bubbles if you're making a fancy quench tank, or by moving the blade about if you're going old school, also speeds up the quench. Heating the water slows it down. The Japanese use soft water at about 105F, for reference. Parks 50 will give a good hamon, but won't curve the blade as much, and may not curve evenly, so you may have to pre-curve the blade in places to end up with an even curve. I just put in a water softener, so the next time I do some quenching, I'm going to have to experiment to figure out how that changes things. To heat, well, an indirect heat, temperature controlled, able to bring the blade up slowly to heat and hold it is desired. 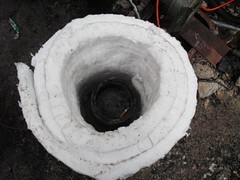 The method used at the hammer in was an old hot water tank, lined with kaowool and satanite, with a baffle along the bottom to even out the heat from the burner, and a couple of thermocouple probes for heat monitoring. Controls were a guy adjusting the burner pressure and choke to get the desired temperature and atmosphere. 1500F for 1050, a bit lower, 1450F for W2, tamahagane, you should start low and go higher to get a feel for the material. And every batch of tamahagane is different. To quench, take the blade out of the furnace, and quickly put it, edge first, into the tank. The blade edge will be fully hard after about a second, but if you pull it out right away the residual heat will temper the steel and destroy the hamon. Give it 3 seconds at minimum. Sometimes, if you have a slow enough quench, you can just leave the blade in; doing so too long can cause the worst sound a knifemaker knows: the ping of steel destroying itself. You can feel the blade go through stages as it quenches: first there's nothing, as a jacket of steam insulates the blade from the water; then a rumble and the blade shakes in your hand as the water makes contact and explodes into steam. As the blade further cools, you can feel it twisting and moving on its own: the steel frozen on the edge resists as the softer, thicker back shrinks, creating the signature curve of the blade and putting immense stresses on it. Finally, everything settles down as the blade drops under the boiling point, and if you haven't heard the blade crack or shatter yet, you're safe. If you're using oil, the quench is less tactile, but involves a lot of flame and smoke. Wear gloves and face protection. Heat and quench the first one without any coating. A polished blade, lacking nucleation sites, creates a steam jacket and quenches very slowly. Observe the effects on curvature, and how the edge, the only real nucleation point, cools much quicker than the rest, usually resulting in the infamous "ping" as the edge cracks. On the next one, use just a thin coating - a wash - of your clay. Since it's nothing but nucleation points and increases the surface area immensely, this is the fastest quench. Again, observe the curves, and listen for damage. For the next one, put a 1/16" thick coat on the blade, covering about 1/3" of the blade surface, the edge of the clay paralleling the edge of the blade. Leave the very spine clean. Don't put a wash on it. Quench. Observe. Listen. Polish and etch -- this one should have a hamon. For the next one, put a hatchwork of "ashi," thin lines of clay, on the blade. Vary the thickness of the ash from thin to thick as you go up the blade, so you can see the different effects. No wash. Harden. Polish and etch -- you should see the ashi leave makes in the blade, fading out towards the edge. By now you should be getting a feel for temperatures. You may actually get to keep this one. For the next few, you're just playing with styles. Each blade gets a wash, with an extra dab along the angle between the blade and tang, as that stress riser can be a cause of problems. Coat the sides 1/3 of the way along the back, over the wash, then apply ashi. For the fifth blade, use a parallel clay coat, over the wash.
For the 6th blade, use a parallel clay coat over the wash, then apply ashi. Vary the thickness of the ashi to observe the effets. For the 7th blade, use a wavy edge to the clay. Match the waves or your blade may also have a wavy edge. For the 8th blade, use a wavy edge and ashi. This will give you enough practice to start using this technique and know what you're doing. 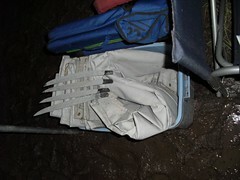 To give an example of how variable and hard this technique is, one of the final actvities of the evening was a heat treatment of some blades clayed up earlier in the day. The first blade, done by Jesus as his sacrificial piece, was indeed sacrificial -- during the quench, he left it in the water too long, or the water was too cold, or maybe the moon, hidden behind the rain, was in the wrong phase. The blade cracked, about halfway along it's length, after only about 5 seconds in the water. The other 3 blades came out ok, though. That's about right. Even the best smiths lose about a quarter of their blades during heat treatment when using this technique.